As I started to mention in last week’s blog, after I’d got back from Bradford’s round of the National Trophy last Sunday I was hoping to get an early night ready for an early start for a trip over to France. Unfortunately, things didn’t turn out as planned. By the time I’d sorted my cyclo-cross pics and got them on their way down the line to the office and then put the finishing touches to the blog and finished sorting my packing for the trip it had gone midnight. I got myself to bed but didn’t really sleep that well, if at all. The trip by the way was to join up and get a photographic record of the Pinarello RT team as new and old team members got together for a training camp and team building exercise down in Bagneres-De-Luchon in the French Pyrenees. With Malcolm Elliott from the team living just up the road from me in Sheffield, we had arranged that I meet at 03:45 am at his place and I give him a lift down to East Midlands airport to join the rest of the team for our 07:05 flight with Ryanair to Carcassonne. Arriving bleary eyed at Malc’s we set out and get to the airport and are in the terminal for just before half five. There’s quite a queue at check in but eventually all the team members get together and we are on our way. Malcolm Elliott, Russell Downing, Lee Davis, Matt Kipling, Tom Murray, Pete Williams, Sam Webster and then from the women’s team, Alex Greenfield, Sarah Byrne, Hannah Rich and Kelly Moore. I sleep for most of the flight and we arrive at Carcassonne’s small airport to chilly and damp conditions. Bags collected we went to get the hire cars sorted only to find that the booked estate cars were not available and that we had been allocated three saloon cars. Two Mercedes and a BMW. With all the kit and one bike that had to be flown over we were never going to fit everyone in. Fortunately I’d brought my driving licence so Malcolm and Russell asked me to help out and drive a fourth car. A VW Polo which we could put the bike in and a few of the bags. With things finally sorted we set off from Carcassonne for Bagneres-De-Luchon in heavy rain. We briefly divert to Toulouse airport to pick up Dan Duguid, Cycling’s tech man, who had also been invited to join the trip. We get to a wet Luchon at two o’clock, a little later than expected, for an arranged dinner meeting with Phil Griffiths and his wife Jackie along with three of their friends. Phil and Jackie had driven down in the team van with all the training bikes at the end of the previous week and stayed over at their apartment. Luchon is a very pleasant spa town and passed through by the Tour regularly with it being nestled at the foot of the Col de Peyresourde, Col du Portillon and the climb up to the ski station at Superbagneres. After a much needed meal it was over to the hotel to check in. The team then went down to the hotel garage to check out their new training bikes and get them set up ready for action. I take my camera down and grab a few pictures as saddles are raised, bars lowered and straightened, pedals added and tyres inflated. At five o’clock we go across the road to Freddy Sports – InterSport shop to get fitted up with skis and boots for the planned skiing later in the week. The day is rounded off with an enjoyable meal in the restaurant next to the hotel and it’s off to bed feeling absolutely shattered. A long eventful day. A brighter Tuesday dawned and it was up early to be ready to set out with the team for a training ride down the valley roads. Dan joined the team on a Pinarello FP5 which Phil had brought down for him to test. I join Phil in the Vito team van and take pictures of the riders from an open side door. Securely belted in I add. I jump out at various points to do some static shots as well. The weather got better as the morning went on and eventually we were under clear blue skies. Over one of the small climbs in the ride I got to see five or six Griffon Vultures effortlessly circling the craggy mountain tops high above the road. Impressive birds with broad wings spanning seven or eight feet. We got back to Luchon with time for everyone to get a quick change and get down to the restaurant for a quick lunch break. With the weather having improved Phil decided we should all get up to the ski station at Superbagneres for a photo opportunity. He wanted some photos in the North Face kit that had been supplied to the team for the trip. The drive up the lower half of the climb was in shadow but eventually the road switched back and we climbed in to sunshine. Temperatures were at -5 centigrade and there were many icy patches on the road after fresh overnight snow had not been fully cleared from the road. Snow conditions looked immaculate. We parked just below the car park to the imposing hotel at the summit. The hotel is like something from a James Bond set. The light was fantastic as where the views and I got a few group shots of all the team in their North Face kit with the snow capped mountains as a back drop. Back down the mountain and back to the hotel. Bikes were washed down from the mornings ride before we all re-grouped at the wine and cheese shop on the main street owned by an ex-French presidential body guard. He’s a friend of Phil’s and so he arranged for this interesting social gathering. It was most enjoyable as we all tucked in to his selection of local and regional cheese accompanied by red and rose wine. Managed to get a few pictures to record the occasion. Then it was across the road to the restaurant we’d had dinner at when we first arrived in Luchon. 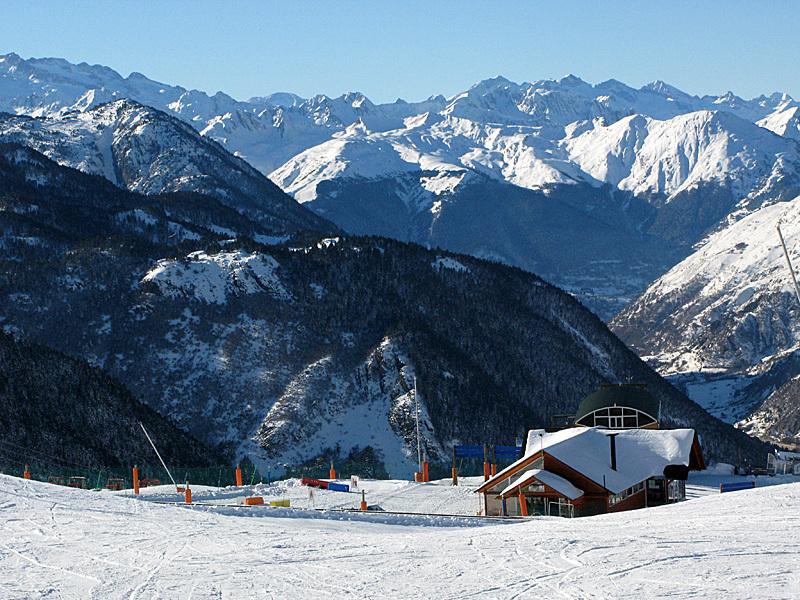 Wednesday and Luchon woke to clear crisp conditions. The plan for the day was for the lads to ride up the valley to St. Beat and on to Vielha in the D’Aran Valley before stopping up at the Baqueira-Beret ski station over the border in Spain to have lunch and then go skiing in the afternoon. About a two hour ride. The girls were having a day off the bikes and were to be driven up to join everyone at the ski station. I drove the Polo so I could grab a few pictures of the team along with Dan as they made their way up to Baqueira. Alex Greenfield joined me in the car for the journey up and became my photography assistant passing over the cameras as I stopped at my chosen picture spots. I have to admit to one very embarrassing moment on the final section on the climb up to Baqueira. I’d seen a picture opportunity but couldn’t really see a point to stop. I tried pulling in, only to sink the offside wheels of the car in to axial deep snow. Much deeper snow than I anticipated. Phil and Jackie stopped and came to the rescue. Jackie jumped in the car as Phil and I pushed and we got the car reversed out of it’s predicament. Drama over, we all convened at the Tuo Blanc hotel for lunch before setting out on to the slopes for the afternoon. There was a mixed ability, so some of the guys, Dan, Pete, Tom and Sam did their own thing having skied before. The rest joined Phil and Jackie for some tuition on the nursery slopes and that’s were I spent the afternoon getting photographs of everyone’s progress. Fantastic conditions, blue skies and snow covered mountain tops as far as the eye could see. Thursday morning I spent with Dan doing some pictures of the FP5 bike for his write up while the team washed and readied bikes to go back to England. Weather conditions were once again superb. A cold, crisp sunny morning. There is definitely a special quality of light in this part of the world. Dan and I did our shots around the old spa buildings at the head of the town before joining up with the team after their team meeting at Phil’s apartment. 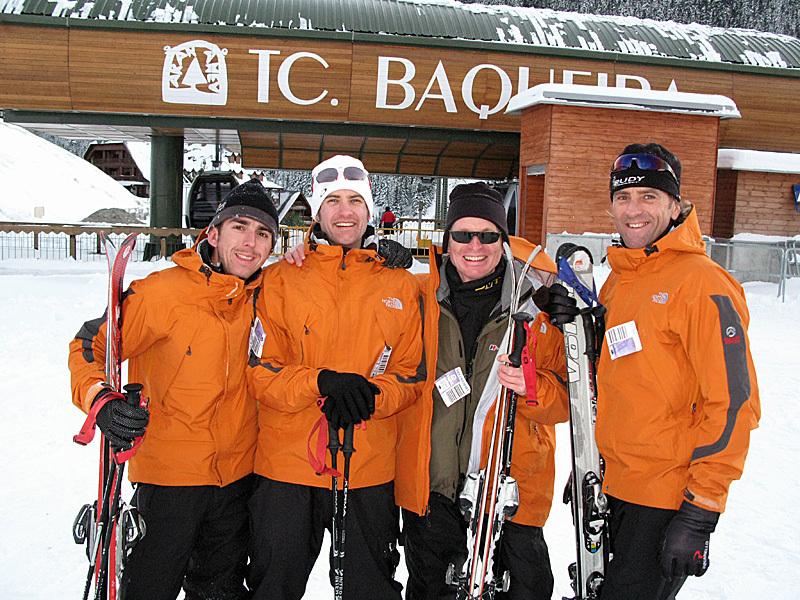 We all then drove up to Baqueira for an afternoon of skiing. On the drive in to Spain I spotted a Red Kite lazily fly over the carriageway towards some Mistletoe laden trees positioned close to the road side. It’s a stunning bird. It’s also amazing to see so much Mistletoe about in the trees and is something I don’t really see much of back home. Looked very feastive anyway. We arrive at Baqueira just before two o’clock. This time I get the opportunity to go skiing. I have skied before but it was quite a few years ago on a school trip to Italy in 1983. There have been other occasions when I’d skied on the local slopes up around Ringinglow village near my home in Sheffield. That again was back in the eighties. Anyway, once I snapped the skis on and had a few descents down the nursery slope things were coming back. So I was quickly venturing higher up the mountain to take on the more testing runs. A most enjoyable afternoon with the team. I still had my pocket Canon G7 at the ready to record a few moments from the afternoon. Unfortunately, I didn’t get chance to capture Russell Downing’s dramatic and much talked about Herman Meir like off. He took a bit of air after a rapid schuss down a blue run and landed heavily. Fortunately he was ok and his only lose was his sunglasses which were buried in a snow drift somewhere. After all regrouping at the bottom ski lift for a few photos at the end of the afternoon, it was back down to Luchon to return the skis and get an evening meal. Got to bed earlier as we all had early starts on Friday. Dan and I had the earliest start on Friday morning, with me having to get Dan to Toulouse airport for a 07:05am flight. I was up at four and Dan soon after so we could set off at just after four thirty. Got Dan to Toulouse for six fifteen and then I continued my journey to Carcassonne airport where I’d meet up with the team later for our flight back to East Midlands. There was dense fog for a lot of the journey and it made me think the flight could be delayed. Anyway, as I approached the airport the fog was clearing and the sun was coming through. The rest of the team didn’t set off from Luchon until 07:00, so I was already at the airport by the time they arrived. Infact they cut it quite fine in the end. Not that it mattered in the end as the flight was cancelled. The incoming aircraft had to be diverted to Perpignan due to the curtain of fog around the airport. It was bizarre as the airfield and surrounding area was in sunshine but then you could see the wall of fog out in the distance. Nightmare! We all had to go and reclaim our bags and Malc and Russ sorted out the plan on how to get a flight back to East Midlands. Initially It looked like driving to Girona (Spain) and staying overnight to get a flight to East Midlands from there on Saturday. Then after discovering the hire car charge for leaving a car at another depot in another country plans were soon changed. We eventually decided on getting a flight from Bergerac to Stansted at 17:20 later that day. So we all piled back in to the hire cars we’d just dropped off and drove up to Bergerac. I thought Carcassonne was a small airport but Bergerac was even smaller. All went well and we arrived in Stansted where Sarah’s dad and Kelly’s dad had fortunately been able to drive down in their Vito vans so as to give us all a lift back up to East Midlands. Arrived at East Midlands at around 21:30 and by the time I’d given Malc his lift home it was just after 23:00. I finally turned the key in my door at about 23:25 after dropping in to Tesco Express on the way back from Malc’s for bread and milk. Had a lie in on Saturday as you can imagine. Managed to get out on the bike late morning to stretch the legs. It was a cold overcast morning and I was glad for setting out later as it had allowed some of the frost and ice on the roads to melt. I did my Cressbrook and Monsal run. Jack Frost’s dusting of magic was still evident over the higher ground with Haw frost blanketing the landscape. On Sunday morning I went out for a ride with Steve, Simon and Mark who I’ve mentioned before. We arranged to meet at the Wheatsheaf Carvery at Parkhead anticipating frosty conditions. It’s on the main road and better if conditions are tricky. It was cold but there wasn’t any frost until we got over towards Foxhouse. Again like Saturday it was overcast and there was a heavy Haw frost over the tops. We dropped down Froggatt and in to Calver where we saw a few of the Whirlow Wheelers getting ready for their Christmas run. From Calver we went to Baslow and on to Pilsbury and in to Bakewell. Then along the flats to Haddon Hall before turning off towards Alport and then up Winster Bank. I saw a five male Bullfinch flitting through the hedgerows along this section. This striking finch has a bright crimson chest, steely grey back, a black head cap and a distinctive white rump which is usually what you catch sight of as it disappears in to the thickets. When we got over the top and down towards Grangemill there was an almighty bang as Simon’s front tyre exploded. There was an inch or so split down the centre of the tyre. Ever resourceful, Simon pulled out a new inner tube, a piece of old tyre and some old inner tube from his saddle bag. Placing the old piece of tyre under the hole in the tyre and then wrapping the old piece of inner tube around the area where the new inner tube would be in the position of the tyre damage he was soon back on the road. He decided though not to chance his luck and left us three to carry on so he could take the quickest and most direct route home. We carried on to Longcliffe and on to Parwich before eventually dropping in to Hartington. A quick pot of tea and some cake at the Charles Cotton Hotel tea room and we were back on the road. Back up to Long Dale, Parsley Hay and over towards Conksbury. Round the back of Bakewell to Ashford before cutting through to Hassop and Calver. Steve set a good tempo up the Froggatt climb. We were doing 12mph average up there. He’s like a rock on the bike, just tapping out the tempo. The pace lifted after the Grouse Inn to 14-16mph. It was then just the drop back in to Sheffield to clock up just over 60 miles. Catch up with you in a week.